How to create a Canvas Print online with Mini Box. 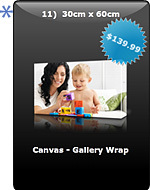 Once you have signed in or registered you will be taken to the Main Menu > select Canvas & Glass Effect Prints. The next window will show you the various canvas print products. Select the panel you require *See example right. Your next option is your choice of image layout. Select from either Fun Layout or Contemporary Layout > Click on its panel to proceed. Next use the editing tools to make any adjustments. Click > Continue Review your order and Accept. AT CHECKOUT: From the Promotions Menu on the left *See below > Select Promotion Code button then enter (cut and paste - case sensitive) Coupon Code from your Coupon code provider or Mini Box email. What is the Quality of a Mini Box canvas print?